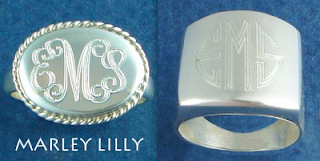 Mississippi Girl Misplaced: Marley Lilly Give Away! Marley Lilly is holding a give away! One winner will get a monogrammed ring! I found this give away on College Prep's blog so go there to find out more! Must enter by January 27 at 11:59pm and the winner will be announced the 28th, but in the meantime go to Marley Lilly and check out all the cute stuff they have! Yay! Its so exciting to have a follower! I'm glad you like the shoe clips/crafternoon :) Thanks for reading!